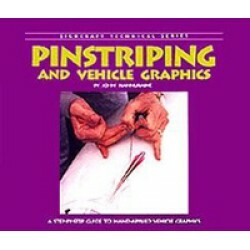 Pinstriping Vehicle Graphics-Book guides you through a basic pinstriping for new Pinstripers. Pinstriping Vehicle Graphics-Book covers simple long-line project and covers the pinstriping skills you need to create your own unique Pinstripe designs. Pinstriping Vehicle Graphics-Book also features step-by-step color photos that detail splatter and dry brush effects, sponge-applied graphics, cartoons used in making the pinstripe graphics seen in this Paperback by John Hannukaine. I've met John Hannukaine many years ago and his work is amazing, he's very talented Artist, Pinstriper and a Sign Painter. Click here for more information and pricing Pinstriping Vehicle Graphics-Book by John Hannukaine.